BEIJING — As the United States and China swap threats and mete out increasingly punishing tariffs, the world is watching to see whether Beijing turns to one of its most potent economic weapons. It involves the number 7. China’s currency, the renminbi, has been gradually losing value since mid-April, and on Tuesday it was at its weakest point in a decade. If the currency weakens any further, it could fall below the psychologically important level of 7 renminbi to the dollar. 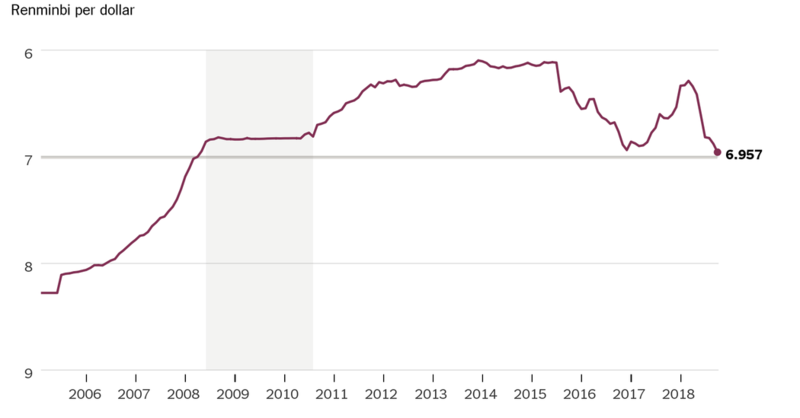 The last time it took more than 7 renminbi to buy a dollar was in May 2008, as the world was slipping into a financial crisis. The Trump administration doesn’t like the idea of a weaker Chinese currency. That could give what it considers an unfair advantage to China’s exporters. In the arsenal of trade disputes, currencies can be potent weapons. But China has good reason to keep its currency from weakening, and it appears to have acted in recent weeks to prop it up. Currencies may be potent weapons, but they are blunt ones — and they can boomerang against those who use them. What happens if the renminbi falls past 7 to the dollar? There is nothing particularly threatening about the number 7 itself. The renminbi at 7.002 to the dollar is pretty similar to the currency at 6.998 to the dollar. But passing that number would be significant symbolically. It would suggest China is prepared to let its currency weaken further still. That would give China’s factory owners an advantage when they sell their goods in the United States. It would also undermine the tariffs the Trump administration has levied on more than $250 billion in Chinese-made products. How would that help China? Say you own a Chinese factory making lawn ornaments, and you sell a lot of pink flamingos to an American retailer. You price each at $1 — they may sell for far more in the United States, but shipping and storage account for most of that. When the renminbi is 6 to the dollar, that translates to 6 renminbi in sales. But when the currency depreciates to 7 to the dollar, that $1 flamingo is worth 7 renminbi in sales to you. Or you can cut the price — say, from $1 to 85.7 cents — and still make your original 6 renminbi in sales. Your American competitor, who has to buy and sell in dollars, has to grudgingly cut prices to compete. A weaker currency can also help Chinese exporters beat President Trump’s tariffs. Right now, the United States imposes tariffs of about 10 percent on a wide variety of Chinese goods that arrive at an American port. If the renminbi has fallen 10 percent, the tariff is basically nullified. Some politicians in the United States and elsewhere have long said that China manipulates its currency, even though Washington officials — including in the Trump administration — have stopped short of official accusations. But in this case, many of the forces weakening the currency are beyond Beijing’s immediate control. China’s financial system is firmly controlled by the government, giving the country’s leaders a great degree of control over how much the renminbi is worth. Officials set a daily benchmark rate for the renminbi and allow its value to move a smidgen above or below that level in currency markets. Chinese officials say each day’s trading activity helps determine the value they set for the renminbi the next day, but they disclose few details about how that works. On Tuesday, Beijing set that guidepost at 6.9574, just a hair’s breadth stronger than 7. In the world of foreign exchange, a higher number means a weaker currency. Right now, traders are sending Beijing a single message: The renminbi should be worth less. The people and companies that hold the currency have become increasingly nervous about China’s slowing economic growth, slumping stock market, fragile real estate market and seemingly intractable trade war with the United States. Inflation has begun to tick upward, and rising prices tend to make holding the relevant currency less attractive. There are other reasons. Since late July, Beijing has tried to prop up the economy by having the state-controlled banking sector increase lending, making money more available. That means even more renminbi sloshing around, weakening the currency’s value. While China hasn’t raised interest rates, the Federal Reserve in Washington has. That makes it attractive for many people to sell their renminbi and buy dollars. Would you rather have a one-year renminbi certificate of deposit that pays 1.5 percent interest now, or a one-year dollar C.D. that pays out 2.6 percent or more? Is the drop deliberate on Beijing’s part? Not quite. If anything, Beijing is trying to keep the renminbi from falling too fast. China has a number of ways to bolster the currency’s value. One option is to follow the Fed’s example and raise interest rates. That would give Chinese families and companies more incentive to keep their money in China. But that would raise the cost of borrowing in China, just as the economy is slowing. Beijing could buy up its own currency instead. Like anything else, the renminbi’s value rises when it is scarcer. Thanks to the way it has managed its currency over the years, China has amassed the world’s largest foreign exchange reserves — a $3 trillion stash of money it keeps in dollars, euros, pounds, yen and other currencies. It has begun to tap that stash. When China’s central bank released its monthly balance sheet a week ago, it showed a drop of almost $20 billion in foreign currency just during September. What are the broader risks? Three years ago, as its economy slowed, China devalued the renminbi in part to give its factories a helping hand. The financial world was shocked. Markets plunged. As Chinese officials hurried to explain themselves, people and companies began shifting their money — money that China’s economy needed — outside the country. A year later, China had spent more than $500 billion from its reserves in an effort to shore up the renminbi. It later tightened controls on the financial system to shut off many ways people used to get money out of the country. Should the trade war intensify, China may look to make more aggressive moves with its currency. But as history shows, there can be a price to pay.